Harvesting The chickens have upped their game. We are getting 3 – 4 eggs each day from our 10 chickens now. The longer days have been making a noticeable difference from shortly after the winter solstice. The herbs on the deck are being put to good use, as are window-ledge herbs, greek basil, mint and flat leaf parsley. Planting I have ordered and received my seeds and am chomping at the bit waiting to get planting. I hope to plant out the seeds that need a long growing season as soon as possible. Chilis and various types of tomatoes will be sowed into seed trays and put up high in the conservatory out-of-the-way of a certain rampaging toddler. My broad bean plants are getting a bit leggy indoors, so they are in the greenhouse tonight, I just hope they are ok, it’s a chilly night out there now. Thinking I have been thinking hard about my plans for the edible beds in my garden. I am taking this as my first design for my Permaculture Diploma. This is great as it making my diploma really relevant to my life. The additional time and thought given to layouts, plants and sustainable systems will make the garden far better than if I took my usual haphazard approach to garden planning. Feeling I have been feeling sorry for the chickens. The storms had ripped a section of the felt off their shed roof. So the break in the weather today saw J and I clambering up the shed and nailing a new roll of felt into place. I am planning on fixing the guttering too this month and making the water run off into a tank for watering, with the overflow going into the pond to keep it topped up. I hope to rig up a soaker hose to this too and direct this around the vegetable bed in front of the chickens run. 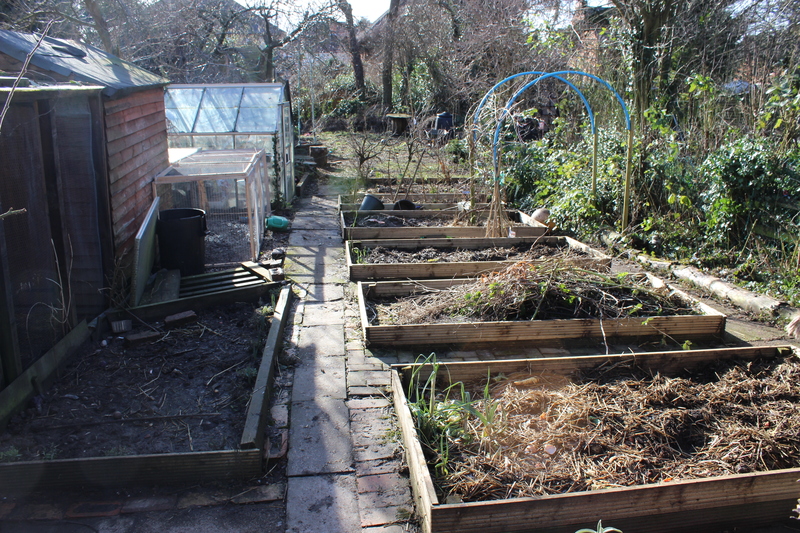 I am feeling full of ideas and enthusiasm for the garden and my Permaculture Diploma. I am also feeling frustrated not to have more time to devote to both activities. 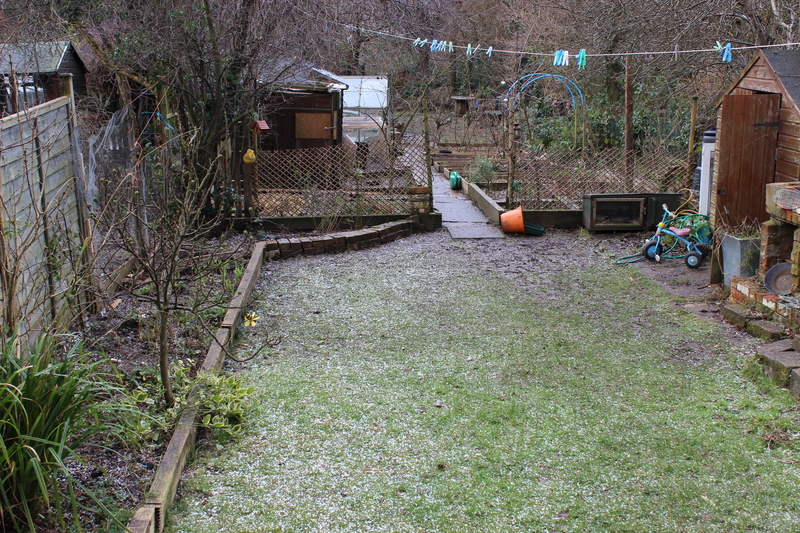 The same view at 2pm, a freak hailstorm turned the garden white in seconds! 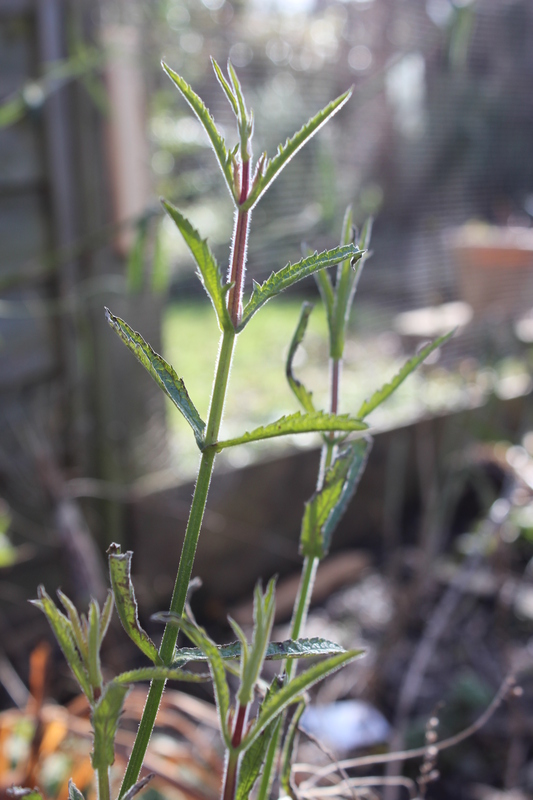 I have just chopped down the old growth to make way for the fresh new shoots of Fennel. This plant has beautiful skeletons I like to leave to stand all winter. This tree I think is an ornamental cherry. My husband and I have a row every year about whether to chop it down or not. It has dark leaves and casts a big shadow over the upper part of our garden all summer long. But I love it simply for its early spring flowers. 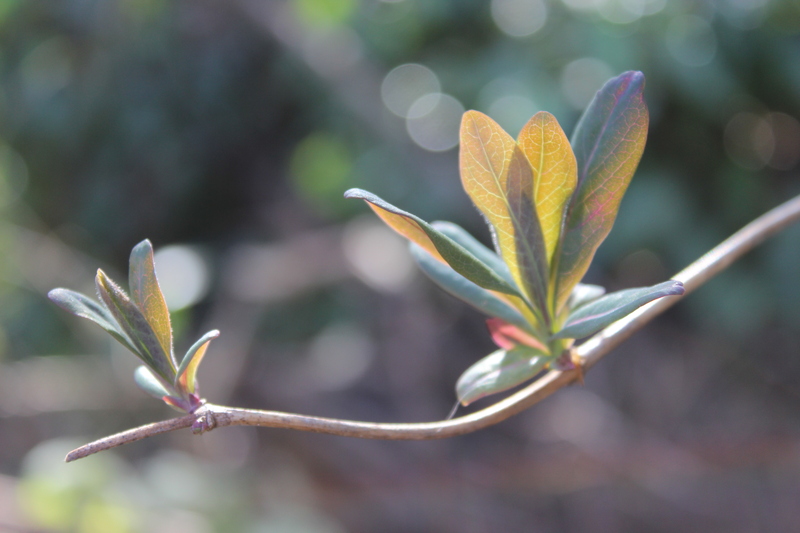 You can see the buds appearing here. I like to cut armfuls of branches each February and bring them inside. The warmth of the house fools the plant into flower within days. I currently have a vase full of pink blossoms on the mantlepiece. The tree holds its place in the garden for this alone. It reminds us that spring is not far away now! 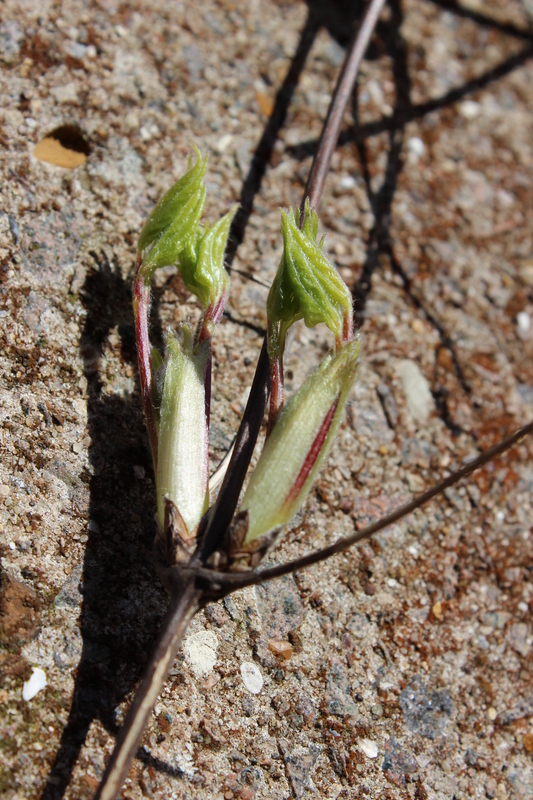 Tiny leaves unfurling on the Clematis. 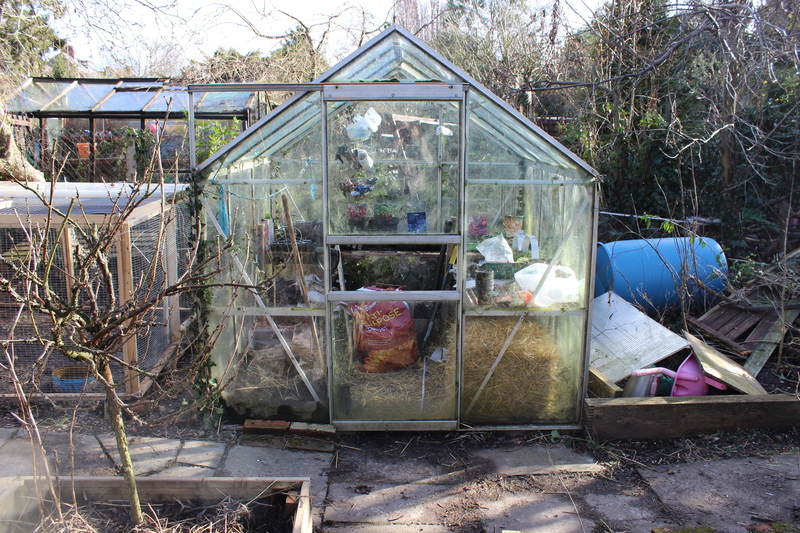 This entry was posted in Uncategorized and tagged chickens, flowers, Garden diary, Hail storm, My garden design, Observe and interact, Permaculture, Permaculture Diploma, Photography, plants, spring, trees, winter by emilycrofton. Bookmark the permalink. Good to see your zone 1,2,3,4 and 5 taking shape Nurture Green.